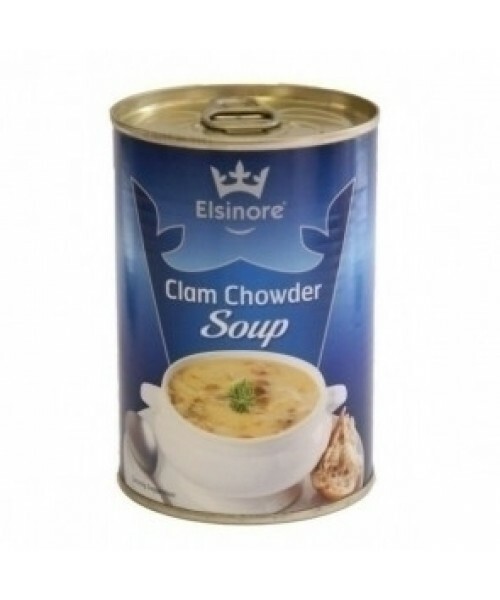 A delicious thick chowder - clams in a creamy sauce with potatoes, carrots, celery and onions. Customers who bought this item also bought the items shown below. 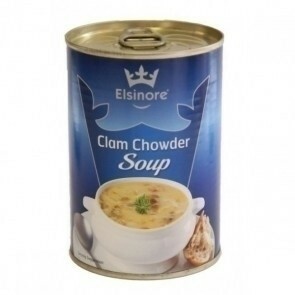 A delicious creamy soup of clams, potatoes, carrots, celery and onion - and nutritious too. Clams are a low in fat and high protein with an above average amount of healthful minerals such as selenium, zinc, iron and magnesium and B vitamins like niacin. Simply heat this soup up and enjoy as a lunch for one served with crusty bread, or as a starter for two. Water, rapeseed oil, clams (Mollusc) (6 %), potatoes, carrots, seasoning sauce [spices, water, Worcestershire sauce (distilled vinegar, water, sugar, salt, caramel syrup, spices), iodized salt, yeast extract, emulsifier (sunflower lecithin)], modified starch (maize), celery, onions, whey (Milk) powder, salt, yeast extract, sugar, spices, cream (Milk) powder, tomato puree, skimmed milk powder, stabilizers( guar gum, locust bean gum, sodium alginate), acidity regulator (citric acid).